But in the last few days, two more suppliers have been outed, when they were named in a USDA food recall, because of fears of listeria contamination. It turns out that Trader Joe's Barbecue Chicken Salad is made by Huxtable Kitchens, in California. 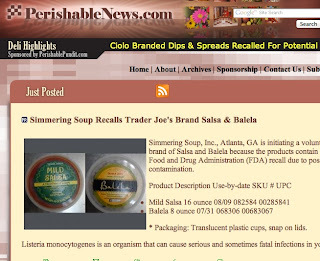 TJ's Mild Salsa, and Balela are both made by Simmering Soups, in Atlanta. All these products are being recalled because of listeria found in onions shipped by Gill's Onions, which is a supplier to both Huxtable Kitchens and Simmering Soups. On the bright side, Trader Joe's California Estate extra-virgin olive oil was one of only two brands rated 'excellent' in Consumer Reports' recent tests of 20+ brands. The other 'excellent' rating went to McEvoy Ranch (which, for all I know, is TJ's source!) California olive oils have really come on in recent years. After tasting an extra-virgin, organic olive oil at the Ojai farmer's market, my wife and I bought a gallon. 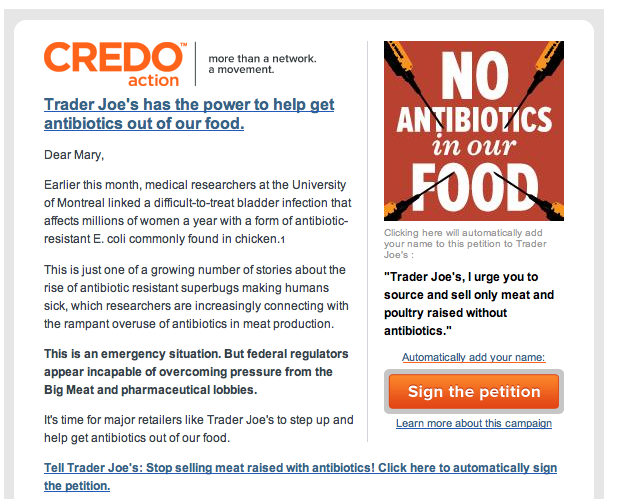 This morning my wife got a petition in her email, on the subject of overuse of antibiotics in meat. 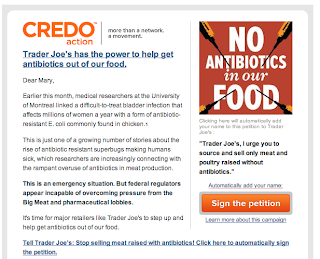 Once again, the petition singled out Trader Joe's -- not because Trader Joe's meat has more antibiotics than anyone else's, but because the petition's organizers recognize that Trader Joe's is a strong brand with a devoted following that probably skews liberal. Trader Joe's is more and more often finding itself awkwardly shuffling its feet and looking down while it explains that even though many of its fans blur the distinction between 'all-natural' and 'organic', if it doesn't expressly say 'organic' it isn't. I once had a customer tell me that one reason she loved Trader Joe's was that all the meat was "raised cruelty-free". I wanted to say, "Uh, you realize all these animals were killed, right?" We understand consumers' concerns with the overuse of antibiotics. Trader Joe's sells lots of organic meat which is raised without antibiotics. Because it costs more to raise organic meat and maintain an organic certification, that meat, of course, sells for a higher price. The meat we sell that is not labeled 'organic' comes from the best sources we can find, at prices we think many of our customers demand. We're often pressured by vocal advocacy groups. As a company however, we tend to listen to our customers. Our customers do get to tell us whether they want antibiotic-free meat, and they do so by choosing organic products. If more and more of them decide to buy organic, rest assured that a larger and larger percentage of our selection will be organic. That approach, along with informative in-store signage and clear labeling, would make Trader Joe's a hero and source of public education on the issue. It would influence other stores and could shape large-scale farming practices. Everyone in the U.S. would be healthier if they ate less meat, of higher quality, and Trader Joe's could lead that charge. Sadly, the company's culture of secrecy virtually guarantees that won't happen. When is a great brand a disadvantage? 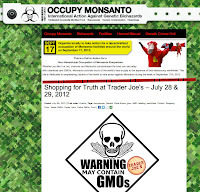 I note that 'Occupy Monsanto' -- a loose knit ("non-hierarchical") group protesting the presence of Genetically-Modified Organisms in foods -- has targeted Trader Joe's stores across the U.S. this weekend. This 'Occupy' spin-off made a mistake when it claimed that "We also know that TJ’s parent company, Aldi, uses GMO ingredients in their low-cost food products throughout America." There are two different Aldi companies, with separate ownership. The company that operates Aldi stores in the U.S. has no connection with Trader Joe's. Trader Joe's shoppers shouldn't expect to encounter the hazmat suit-clad protesters, since I get the feeling there might be a few dozen protesters scattered across several hundred stores. Still, you might spot them in politically sensitive or active locations like the Bay Area or D.C. Trader Joe's does claim "no genetically-modified ingredients" are found in any own-brand products. 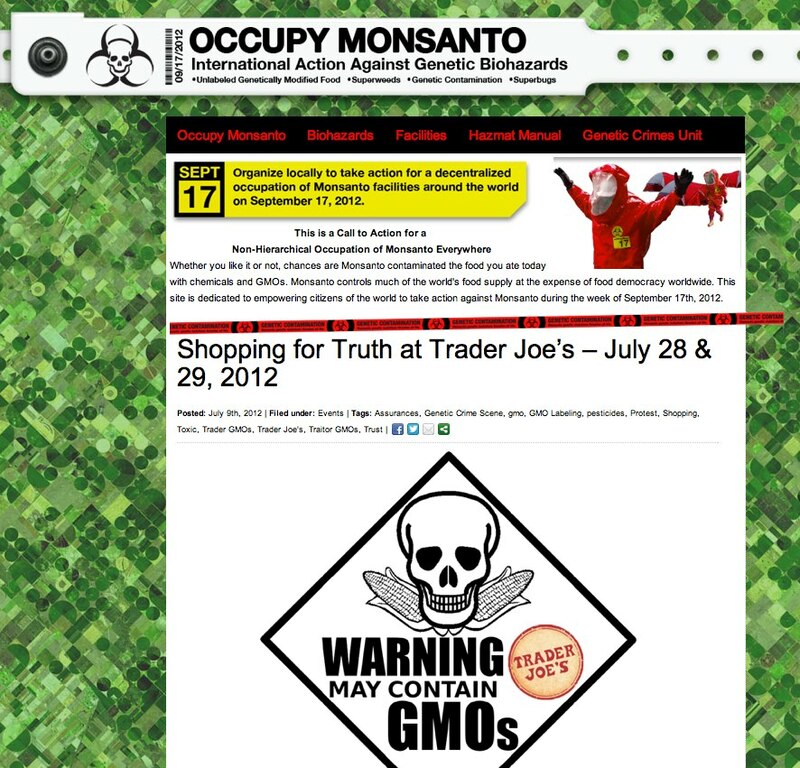 According to Occupy Monsanto, however, Trader Joe's hasn't provided proof to go with that assurance. Proof would come, presumably, with certification from an organization like CERT ID. But I doubt that Trader Joe's knows whether or not its products contain GMO ingredients. Trader Joe's doesn't make any of the foods they sell. So picture the guy in Italy who makes pizzas by the million and ships them to Trader Joe's here in the U.S. That Italian pizza maker, in turn, buys corn meal that he sprinkles on the the crust. He buys that from a company that buys it from a mill; the mill buys it from a farmer. Is that farmer planting GMO seed? Now that the genie is out of the GMO bottle, only expensive lab testing and ongoing vigilance can really assure shoppers that they're buying GMO-free. That's not Trader Joe's (penny pinching) style. But why should Occupy Monsanto pick on Trader Joe's, which is almost certainly not a worse-than-average offender? 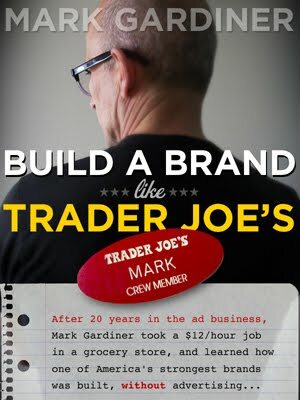 Ironically, Trader Joe's strong brand and loyal customers make it a target. The mindless drones randomly shopping at Von's or Walmart probably don't care whether or not they're consuming GMOs, and certainly don't expect those stores to look out for their welfare; effectively, those chains are insulated against such bad press by their own -- and their customers' -- indifference. Occupy Monsanto hopes that Trader Joe's passionate, educated customers will care about the presence of GMOs and pressure the company to comply with transparency. Trader Joe's head office could (but probably won't) take a strong (and expensive) stand on the issue. It doesn't have a history of being a leader on such issues; it only took steps to stop selling unsustainably harvested 'red list' fish after it was publicly and aggressively shamed by Greenpeace, an organization with a lot more clout than Occupy Monsanto. The chain's top management is never transparent anyway, so it's the victim of its unique combination of brand strength and secretiveness. For more on Occupy Monsanto, go here. 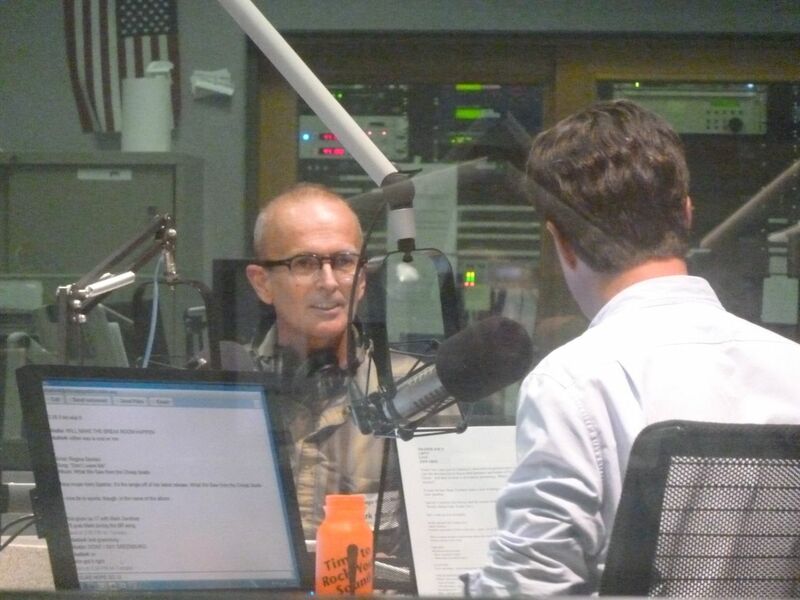 It was cool to find myself in the studios of WBEZ, Chicago's legendary public radio station; it's the home of great shows like 'This American Life'. Last Tuesday on 'The Afternoon Shift', Steve Edwards and I had a great chat about the way Trader Joe's built its incredible cultural brand.